Current Dutch League Champions Amsterdamsche Football Club Ajax – or simply Ajax – are making themselves comfortable in São Paulo. Having arrived a couple of days back for the friendly against Palmeiras this coming Saturday, they today visited the Football Museum located at the Pacaembu Stadium before conducting a training session. Earlier in the morning, Ajax coach Frank de Boer met with Luiz Felipe Scolari for a quick chat and a few interviews for Ajax TV, the Dutch club’s own football channel. Founded in 1900, Ajax are one of three clubs that historically have dominated the Dutch national football league (the others being PSV and Feyenoord) and are considered one of the most successful clubs in the world, being one of the five that have earned the right to keep the European Cup and to wear a multiple-winner badge (consecutive trophies 1971–1973). 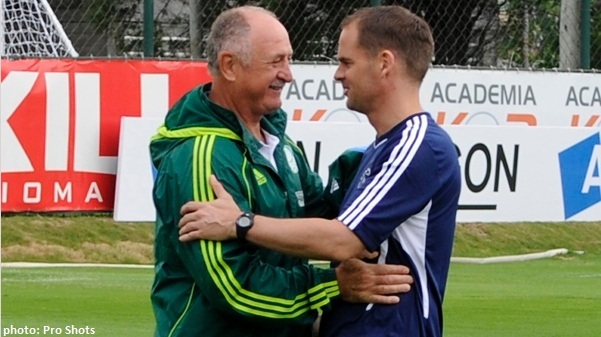 “Dutch football is highly regarded here in Brazil”, commented Scolari. “Not only for its tradition, but also for the manner they play the game, how they keep the flow, their technique. As we’re playing a friendly I believe the game will be a bit slower, also due to the teams being in between seasons. But we’ll take advantage of this duel to learn a few tricks in regard to the good football played by Ajax”, he concluded. Ajax will conduct eight training sessions at the Palmeiras grounds – alternating with the Palmeiras squad – before Saturday’s game at the Pacaembu stadium. Kickoff is set for 5pm, local time, with yours truly in loco.